Let’s start with clarifying what I mean by spring onions. It’s a confusing vegetable particularly in Australia and could be the cause of messed up dinners due to international differences. The most common, in my experience, is the Allium Cepa – this is your gold old garden variety onions with brown/golden skin and one of them fits nicely in your hand. Then we move down in size to what I believe the Americans call Spring Onions and Australian’s call Spring Onions (sometimes), also known as Allium cepa var. aggregatum. Note it’s the same family of Allium cepa but of a botanical variety (i.e. characterised by it’s similarities with other species) of aggregatum. These are your small golden bulbs that a more elongated than your usual Allium Cepa (normal onions). Most commonly in NSW at least we call them Spring Onions or Shallots. However they are more technically called scallions. But again they could be “Welsh Onions”. Jumping onto Wiki (BTW I recently donated some $ to keep it free – highly suggest you do the same) we can get it’s view. Allium ascalonicum – known as eschallots or shallots. These are small golden bulbs similar to small general variety onion (Allium cepa). If you have recipie that calls for Shallots or even Spring Onions and you need to add it very early in the cooking process (like normal onions) – this is probably what they are talking about. Allium fistulosum – also known as a “Welsh Onion” which will never grow a bulb. These are sold as long green leaves in bunches of 4 or 5. Scallion – pretty much the leaves of any of the above and indeed any leaves of the Allium family that haven’t yet formed a bulbous root. The last 2 you’ll add these late in the cooking process and really don’t want a strong onion flavour – stir frys for instance or added raw to a potato salad. Still confused? I’m not surprised. At the end of the day you want to think about they “WHY” you are putting in an Allium family plant. Is it for strong flavour (normal onion (Allum Ceda) or Garlic)? Mild flavour (bulbous alliums like the Allium ascalonicum)? Subtle flavour (green leaves like scallions or chives)? Visual appeal (subtle red onions, scallions or chives)? I wonder if there are other names people use? 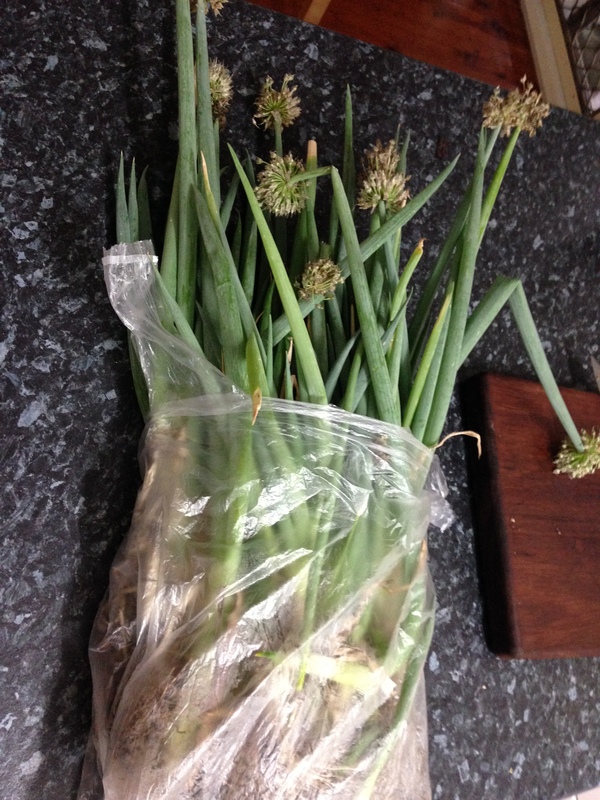 My next post will be how to get a life time supply of scallions / green onions almost for free! I haven’t bought any for over 5 years and have more than I need!